You know, people tend to get down on state flags because too many of them go the direction of 'Seals On A Bedsheet' and Michigan almost does that- but this is more a 'Coat of Arms On A Bedsheet' which is enough of a change of pace from so many State Flags out there, I'd rank this one in the upper echelon of the state flags. It's striking- and you can see plenty of brown on the flag, with the elk, the moose and the eagle. The Coat of Arms depicts the sun rising over a lake and a peninsula, a man raising his hand which stands for peace and holding a long gun representing the fight for state and nation as a frontier state. 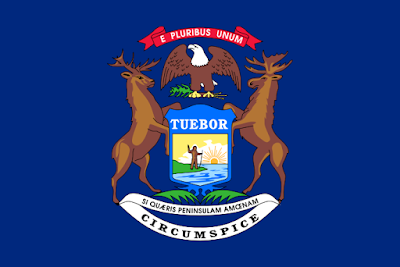 The elk and the moose are taken from the Hudson Bay Company's Coat of Arms and depict animals found in Michigan. The eagle stands for the United States, which carved out the state from the Northwest Territory. "I pledge allegiance to the flag of Michigan, and to the state for which it stands, two beautiful peninsulas united by a bridge of steel, where equal opportunity and justice for all is our ideal." I really need some Michiganders to weigh in here. Is this on the level or just some Wikipedia-fever dream?